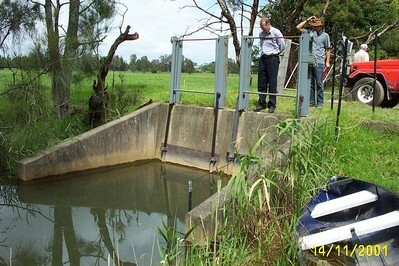 Description: Riverwatch obtained $69,000 in 2001 from the Federal Government to assist the University of Wollongong to develop a smart floodgate. The purpose of the floodgate is to automatically mix salt water with drain water to neutralise sulphuric acid. This acid is formed after rain on soils where acid sulphate compounds have been exposed through clearing of land and the construction of drainage channels. The concept was to have the Smartgates monitored by the Council so that realtime information would be obtained to assess the amount of acid in the drains and remotely control the gates. If excess acid escapes into nearby creeks then there is a high probability of fish kills. Cost: Total cost was $171,618 with funds and in-kind assistance from federal, state and local government.